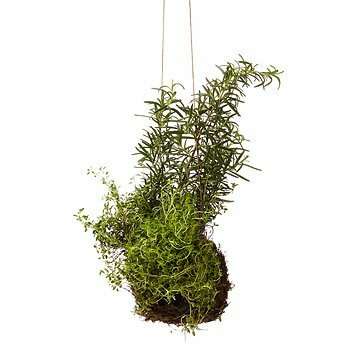 Think outside of the herb box by displaying this living sculpture made entirely of ambrosial rosemary and thyme. Designed to hang up and out of the way, saving precious counter space, this tantalizing tangle of herbs provides a feast for the eyes and is a delight for burgeoning green thumbs and cooks alike. Simply soak the ball in water every two to three days and place in bright, indirect light. Snip and sprinkle a bit when your recipe du jour calls for a dash of either herb. Handmade in Brooklyn, New York. Soak in water every 2-3 days and place in bright, indirect sunlight. We just couldn't work it out. I love this concept, and I love how pretty it looks online. Unfortunately, after I ordered this I received one plant that was dead and another that was dying. The seller was awesome and replaced it promptly with free overnight shipping so the new garden would arrive in good condition. The new one was perfect. I hung it up and followed the instructions very closely, but despite my best efforts, the plants died. I should have taken them out of the ball and planted them in containers to see if that would save them, but I just loved the concept of the hanging garden so much that I tried to nurse them back to health. Maybe the conditions in my house aren't right for this particular type of garden; I can keep other houseplants alive so I don't know what the problem was. :( I really did love this, though! The ball appears to be sturdy and healthy. However, thyme was not included in the pairing. It is only rosemary, and the tallest sprig was broken upon arrival. A bit puny compared to advert. We assume it will flourish over time. Lovely fragrance. Enjoy fresh mint for your sauces and cocktails with this easy to use indoor garden.